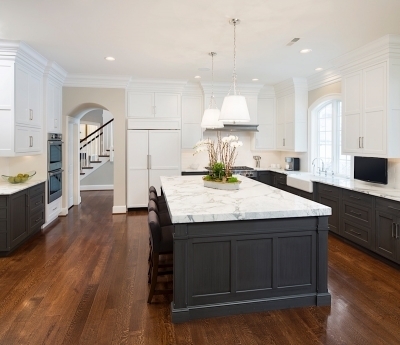 Over the last decade, kitchen design styles on Cape Cod have remained consistent. White, shaker style cabinets, subway tile, granite countertops, and stainless steel have held court as the fashionable combination for achieving the desired Cape Cod Coastal kitchen. According to Mark Bogosian, owner of Longfellow Design Build, for the first time in quite a while, homeowners are showing greater flexibility when it comes to designing the heart of their home. “Our clients are beginning to consider a wider variety of colors and textures in their choice of materials and finishes. They are also incorporating cutting-edge technology, and customizing spaces to integrate with their family’s unique needs and lifestyle.” Here Bogosian and his architectural design team predict the best kitchen design trends for 2018 and beyond. Kitchen featuring 2″ white quartz countertops, traditional white cabinets and contrasting dark blue-gray base cabinets provides visual contrast and a sophisticated look. 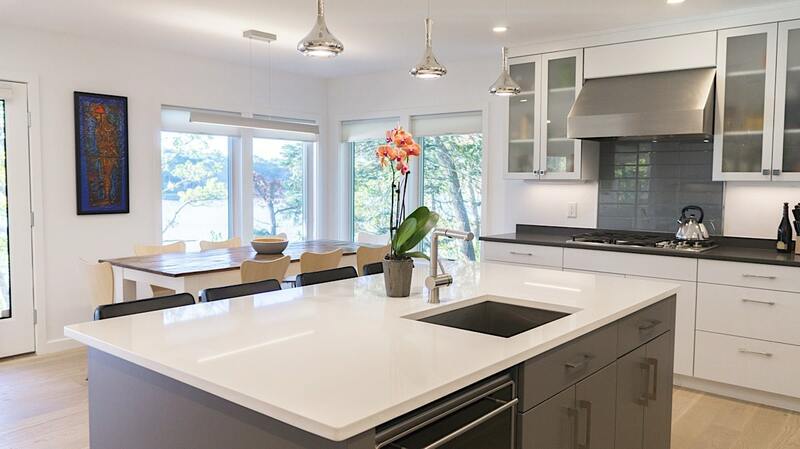 While white remains the cabinetry stalwart—especially in New England where traditional architecture reigns—Bogosian says there’s been a noticeable increase in clients choosing color. For example, white wall cabinetry with base and island cabinets in a deep shade of navy, a warm-toned gray, or a subtle sage green elevates the overall impact. “Carefully working shades of color and texture into a kitchen design increases overall visual interest and depth,” he says. As for his clients that do choose all white cabinets, Bogosian finds they’re open to incorporating color in other areas. “We have so many new, and unique materials in our showrooms that provide homeowners with style choices never before available. A leathered quartzite countertop, hammered copper range hood, blonde wide-plank bamboo flooring, or a decorative lighting fixture can go a long way to offset a wall of white, kitchen cabinets” he says. 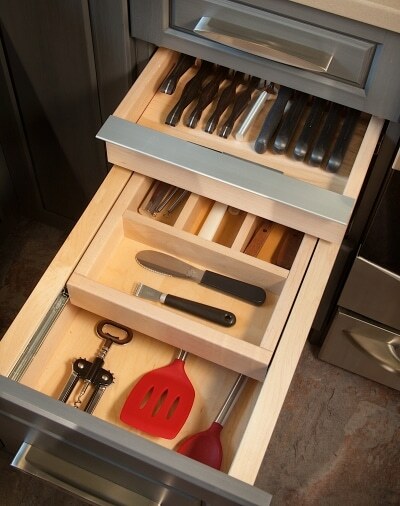 Multi-tiered drawers provide easy access to all your kitchen tools with a place for everything. Like all areas of the home these days, the kitchen is rife with opportunities to install new technologies that simplify and automate everything from water filtration to room temperature and turning on a faucet. Smart technologies can also be incorporated to conserve resources and create a more environmentally friendly space. Given Longfellow Design Build’s Cape Cod location, it’s no surprise their kitchen designs reflect the demands of a Coastal, New England lifestyle. To see more inspiration from Longfellow Design Build, check out their online portfolio here, or visit one of their ‘Main Street’ (yes, they are all on Main Street) showrooms on Cape Cod in Falmouth, Chatham, and Osterville, MA.